It's been a while since I've updated my blog. I've mentioned before that I follow a few foodblogs myself...I find them an awesome medium for ideas... inspiration... plus.. I love reading about food and recipes. 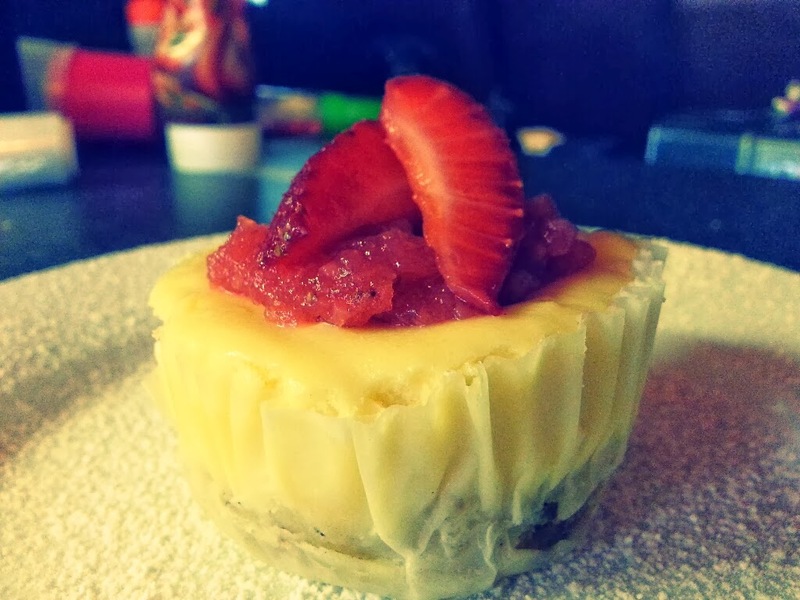 So this recipe for the mini cheesecakes was on one such blog. They looked to die for and I'm hoping mine aren't too far off. The cheesecakes themselves aren't too difficult to make. The strawberry jam/jelly stuff on top was new to me as well as the biscuit base. The biscuit base wasn't especially challenging, I just usually take the easy way out and buy tennis biscuits. This base is quite nice though. Will definitely make again. So I made the cheese cake... popped them in the oven and began to attempt the jelly. It was my first time using gelatine. I wasn't quite sure how to add the powder. The recipe uses a gelatine leaf which was softened in water. I added the powder to water and it went all funny... my I mother in law suggested dissolving in hot watrr water first but I didn't really want to do that because I was supposed to add it to the strawberries. ?.I eventually figured it out... simply add the grouped (powder and water) to the warmed strawberry puree. Needs heat to dissolve. Once dissolved. Let it cool to set. Word of advice...don't let it set too long before adding to the top of the cheesecake.... One woulden assume that if you got it at just the right consistency...you could pour on the puree and it would be set enough to not run off the edge and not too set so that you can mould it like that slime stuff we played with as kids.... hint...mine was a bit too set. Still tasted yummy.!!! So having navigated the jelly...I thought I was home free. Hahaha.... nope... These little things were a b@$%& to get out of the muffin tins. Because the set cheesecake is still soft...They squish so easily. I am not sure what the answer is for this because the muffin tin is the best receptacle but.... I did manage to get a few out...indent free... which was an achievement! They tasted so good. :) (happiness) The lemon adding a nice tartness to lighten the dense texture. My husband said he might prefer even more tartness next time...so will see. If the strawberry jelly is too daunting to make... The shops have some nice fruit puree toppings too. Passion fruit could be really good too!!! To make the cheesecakes, line a 12-hole muffin pan with cupcake liners. To bake the pasty, preheat the oven to 200 C (400 F) and line a tray with baking paper. Place the butter, water, oil, sugar and salt in an overproof bowl. Put the bowl in the oven for about 15 minutes, until the butter is melted, bubbling, and just beginning to brown around the edges. Carefully remove the bowl from the oven and dump in the flour. Stir quickly, until the dough comes together and pulls away from the side of the dish. Spread the pastry out evenly and thinly on the lined tray. Bake until golden. Allow to cool. Break the pastry sheet into chunks and blitz in a food processor until a fine, crumbly, buttery, wet mixture forms. Divide the biscuit mixture between the 12 muffin liners (about a tablespoon in each) and press down to form a flat, smooth, compact base. Refrigerate until required. Reduce the oven to 160 C (325 F). In the food processor or using a stand mixer, blitz the cream cheese, sugar and lemon zest until smooth and creamy. Scrape down the sides and blitz again. Add the eggs and blitz until combined. Scrape down the sides again. Add the cream and lemon juice and once again blitz until smooth and combined. Transfer the cheesecake mixture into a jug. Pour the mixture into the muffin tins, filling each cup to the top. Place in the oven and bake for 20 minutes, until just set with a slight wibble in the center. They will continue to set as they cool. Keep them in the tin at room temperature for an hour, then refrigerate. While the cheesecakes are cooling in the fridge, you can optionally make a jelly. You can use as many strawberries as you like, and add sugar to taste. I used one punnet of berries, hulled them and blended them with a tablespoon of sugar using a stick blender. Weigh your mixture (or pour into a measuring jug and check the volume) – for every 100ml of strawberry purée, you will need 1 gold strength gelatine leaf. Heat the strawberry purée in a bowl sitting on top of a pot of simmering water until it is warm to the touch. Meanwhile, soften the gelatine in cold water for 3-5 minutes, squeeze out the excess water and stir it into your warm strawberry purée. Place a tablespoon or two of the jelly on each cheesecake, garnished with half or a quarter of a strawberry and returned them to the fridge to set completely.